I saw mermaids. Let me repeat – I saw mermaids. Live swimming, breathing, singing mermaids. In Florida. It was part of my SAGA quest. And it was awesome. When it was released, the Little Mermaid was the best thing since sliced bread. Disney hadn’t had a blockbuster hit (I mean Oliver & Company? Really?) for quite some time and suddenly they had their new fair skinned, red-headed princess boasting 80’s bangs and bringing in the mega bucks. What could be better? I hadn’t thought about mermaids pretty much since my musical debut and the animated movie’s overwhelming success (Ariel tends to be one of those Disney princesses I forget exists), till I saw a documentary about mermaids in Florida. And I am not talking about the two hour special on NatGeo or Discovery or whatever channel that tried to convince you of the physical evidence that proves mermaids exist. 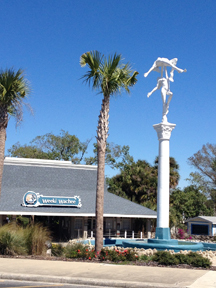 I saw a show on the history of a tourist trap outside of Tampa. It was tacky, but it was quaint. And above all, it was nostalgic. So it was right up my alley! 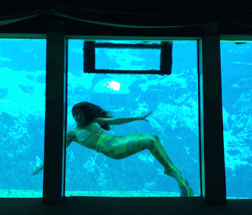 The Weeki Wachee Mermaids at Weeki Wachee Springs Park in Florida are SO worth any detour. As I pulled into the parking lot there were mermaid sculptures on poles. Gardens in front of the gate. It was a bit chilly and sparse that day in March with winter still rearing its ugly head (yes, even in Florida), and though the park is definitely dated, I could totally envision what it looked like in its heyday. I felt like I should have been pulling into the lot in a 1950’s Continental donning a bouffant, peddle-pushers and a peplum top. !!!! Can it get anymore kitschy than this?!!! OMG!!! 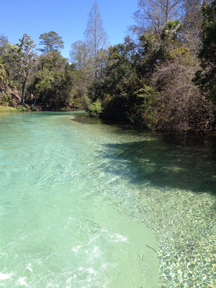 Weeki Wachee Springs is the deepest fresh water cave system in the United States. It is crystal clear and gorgeous. 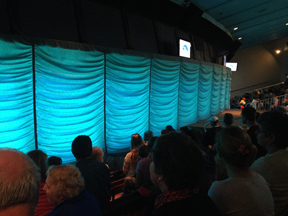 There were a couple of mermaid shows offered. I thought I would check out the first one, maybe ride the river tour and head out. The river tour. Crystal clear and gorgeous. But the first show, which included how the mermaids actually do their thing, was SO captivating, I had to come back for the following show. 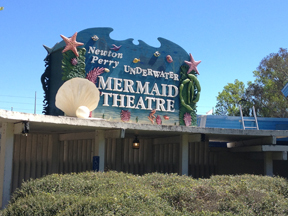 Inside Newton Perry’s Weeki Wachee Mermaid Theater. Demonstrating how they do their mermaid thing. 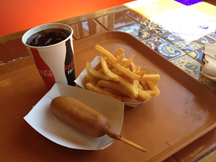 I’d grabbed a corndog in between. It seemed fitting. My lunch. It just felt right. So what was the second show? The Little Mermaid!!! Obviously. The prince and his mystery woman dancing on stage. After the show you could get your picture taken with one of the mermaids or buy one in the souvenir shop. This place was so kitsch – I could hardly contain myself. Loved. It. The park is relatively low-key when you have things like Universal, Sea World and Disney just a hop across the highway, but it was the type of place I would take my kids (if I had them) before anywhere else on a family vacay. It was a throw-back to the good old days and the sort of establishment that needs to be shared with the next generation and saluted for not selling out. I smiled at the sweetness and sincerity of this little park, off the beaten path, in some random Gulf-coastal town in Florida. The best $13 I have EVER spent in that state and absolutely worth every penny. A perfect no-take-back. 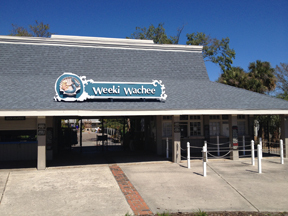 Have you ever been to Weeki Wachee? If so, share your story in the comments section below. Week Wachee. Go there. Watch mermaids. Be a part of American commercial history. 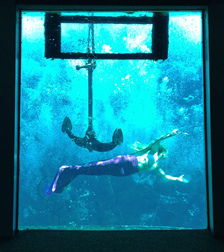 This entry was posted on Friday, May 2nd, 2014 at 4:14 pm	and tagged with Florida, mermaids, natural springs, no take backs, nostalgic, park, SAGA, Weeki Wachee, Weeki Wachee Springs and posted in No-Take-Backs. You can follow any responses to this entry through the RSS 2.0 feed. « Throw-Back-Monday: An Art Garfunkel Concert Anyone?